After leaving the corporate world behind, Jeannette is now the CEO of her household at The Adventures of J-Man and MillerBug. Chronicling her daily life with her two adorable boys and wonderful husband, you'll find the cutest pictures showing the highs, the lows and everything in between (and even a fun review and giveaway thrown in as well). If you like bows, tutus, dresses, family, giveaways, and more, then Honey Pie Accessories one blog you're not going to want to miss! Elaine is a creative, crafty mom of an adorable little girl with another due in just over a month. Don't miss her amazing creations and check out her shop and Facebook page for details on putting in your own order! A heartwarming blog about Thor's journey to get an Autism Service Dog, Erin's writing at Paws 4 Thor will move you from the first sentence you read. 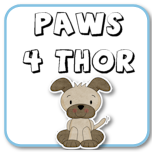 Visit to learn about all of the amazing benefits that a well-trained service dog can provide for children with Autism and all of their unique needs... as well as to cheer on Thor as he continues to move forward with the 4 Paws 4 Ability program! Now that you know about these 3 wonderful blogs, it's time for you to join in! Add your family-friendly link below and we'll see you back here every Friday! And don't forget, you can get the InLinkz code to share the link list on your blog, too. Hi there! Thanks so much for hosting this bloghop! Already a follower! Thanks for hosting the Linky! Don’t forget to stop by my blogs and participate in "Stalk Hop Friday"! Now with 6 ways to Link-Up! This week, we're discussing Blog Advertising at Create With Joy. I hope you'll swing by and join the discussion when you have a moment! Follow you on GFC and twitter! Thanks again for hosting the friday follow! We already follow your wonderful blog! Thank you for the linkup. Happy Friday, my friend! I hope you and your family have a wonderful Easter weekend! When I get my $50.00 certificate I would like to buy the Wax Seal Leather Necklace - Ornate Monogram, vintage finish (WSN005) for my son.